Antimicrobial peptides (AMPs) are one of the most important categories of antimicrobial agents which continued to be the subject of attention during the past years because of the rising resistance of pathogen bacteria against common antibiotics. In the recent years, scientists worldwide have made significant efforts to introduce antibacterial peptides such as hybrid peptides of CM11 (WKLFKKILKVL-NH2) and CM15 (KWKLFKKIGAVLKVL-NH2), buforin II, and magainin  which act mainly on the bilayer membranes. These information has obtained using the analysis changes of membrane in the presence of peptide., Nowadays, a lot of effective AMPs were introduced around the world, hundreds of which exist in living organisms such as fungus, plants, and animals., In the recent years, however, the efforts for making peptides with 30–40 residues length have been performed in large number of laboratories. When antibiotics were first used successfully in treating infectious diseases, many scientists believed that humans have finally succeeded curing infectious diseases forever. However, after some decades and because of drug resistance, this group of medicine will no longer control over infectious diseases. Antibiotics are mostly used among patients while its overdose can be dangerous due to drug resistance and/or common side effects. Because of the importance of investigation on novel antimicrobial agents, in this study, the bactenecin peptide will be inserted in the bilayer lipid membrane of palmitoyl-oleoylphosphatidylcholine (POPC) as a model, and its probable effect on the membrane will be investigated using the powerful method of MD simulation. Basic structure of a sheep bactenecin was extracted from 4JWE pdb code of RSCB protein database. All the steps of the simulation were performed by GROMACS 5.1.0. A GROMOS 53a6 force field was used for all calculations. The basic structure of POPC bilayer and the parametric files for GROMACS were taken from Tieleman (http://moose.bio.ucalgary.ca). Periodic boundary conditions were applied in all directions. A cutoff of 1 nm was applied for electrostatic interaction measurements using particle mesh ewald (PME) method. Short range cutoff of van der Waals energy was adjusted in 1.0 nm in the MD simulation. The NVT and NPT ensembles were used to fix temperature and pressure in 300 K and 1 bar using Berendsen et al. thermostat  and Parrinello and Rahman barostat, respectively. All bonds were treated by linear constraint solver method to constrain around their equilibrium distance. 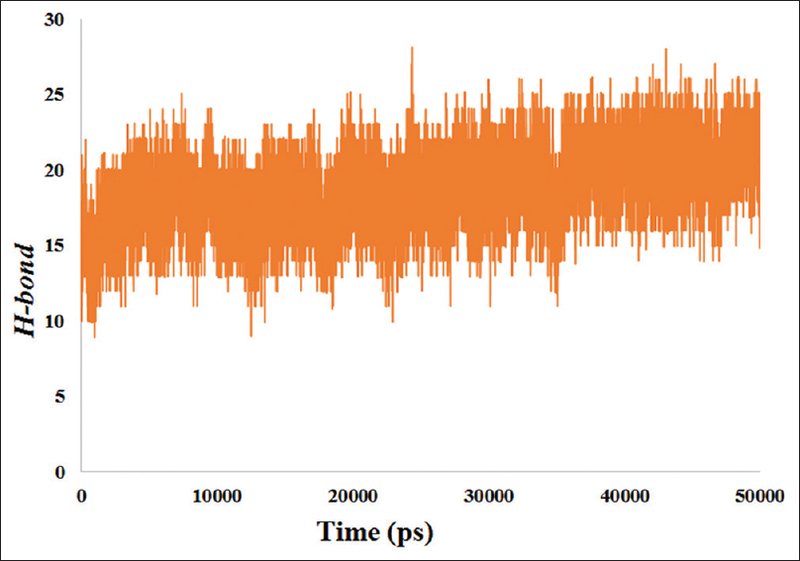 Finally, a 50 ns of MD simulations was performed using leapfrog algorithm. Molecular structures and graphics were generated by VMD is a freeware from Illinois University. (www.ks.uiuc.edu/Research/vmd, University of Illinois at Urbana-Champaig, USA), as well. Simulation of peptides in water was done by putting the bactenecin molecules in a cube sized of 6.441 nm × 5.903 nm × 6.575 nm followed by solvation with 5150 water molecules of Extended Simple Point Change (SPC/E) model of water. This system was neutralized by adding four atoms of chlorine. The bactenecin were put in a membrane which consists of 128 molecules of POPC and four chlorine atoms, and 3355 water molecules, and will be called bactenecin/POPC from now. The InflateGro method is used to make a cylindrical-shaped hole in the biobilayer membrane around the bactenecin. The axis is placed vertically on the biobilayer. A free POPC system also was simulated in order to compare its changes with those of POPC in the presence of bactenecin. To investigate probable effects of antibacterial peptide of bactenecin on lipid biomembranes, MD simulations were applied. Investigating root mean square displacement (RMSD) [Figure 1] has implied that all systems reached stability after the equilibrium time. As can be seen in [Figure 1], the curves reach to a stable plateau after 20 ns. In bactenecin/water system, it has increased up to about 3 nmin <10 ns and after that has stabilized. In bactenecin/POPC system, the RMSD values have increased up to 3.5 nm and then have remained constant. The obtained results confirmed the well-equilibrated systems for performing further analysis. As in literature by Klepeis et al., a higher RMSD corresponds to a more unstable structure and a lower RMSD represents a more stable peptide. These differences propose that the bactenecin has different overall dynamic behavior throughout the MD simulation in two studied systems maybe because of more flexibility of peptide in the lipophilic medium of the membrane. Radius of gyration (Rg) is a measure of the amount of compactness or opening in the given structure. Rg values in both Bactenecin (BAC)/POPC and BAC/water have not changed significantly and reached to a balance of 8.5 A o after about 35ns of simulations [Figure 2]. 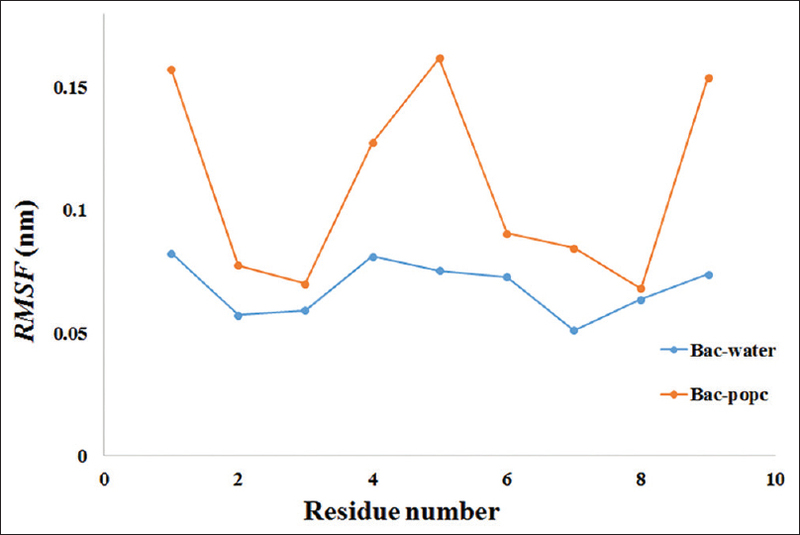 These results show that this is no difference in peptide length neither in water nor in lipids. Considering this result along with the more values of RMSD for peptide in bilayer medium, it can be concluded that the amino acid side chains undergo some displacement in membrane medium. 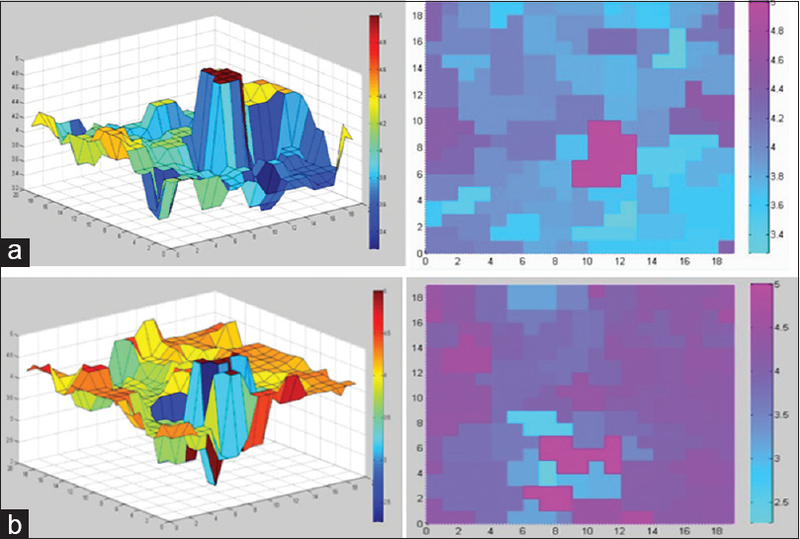 Root mean square fluctuation (RMSF) has been studied in both systems during MD simulations. As it can be seen in [Figure 3], the RMSF values of bactenecin in POPC are higher than bactenecin in water. The rising trend in RMSF of bactenecin in POPC is a result of more fluctuation and mobility of peptide in lipids. Analyzing RMSF analysis shows that fluctuations are more close to C and N terminals of bactenecin. About the values related to peptide in bilayer medium, those hydrophilic leucine and proline residues which exist in the middle of peptide have even bigger fluctuations than others. These vast fluctuations of peptide can also cause instability in biomembrane and destroy its native configuration. As well as the covalent bonds and salt bridges, hydrogen bonds (H-bonds) are among the most key interactions between macromolecule and its environment. H-bonds have different levels of strength from nearly as strong as covalent bonds to as weak as van der Waals interactions. In a particular peptide, the H-bonds which act as connectors provide plenty of strong units., The bactenecin is studied regarding the H-bonds in the POPC bilayer biomembrane [Figure 4]. The conditions r ≤ 0.35 nm and ≤60° were used as criteria for a H-bond to exist (a H-bond was assumed to exist if the donor-acceptor groups' distance was not more than 0.35 nm and the angle of donor-hydrogen-accept or triplet was not more than 60°). There are two arginine residues which can have more important roles relative to other residues in forming the H-bond with the biobilayer membrane. 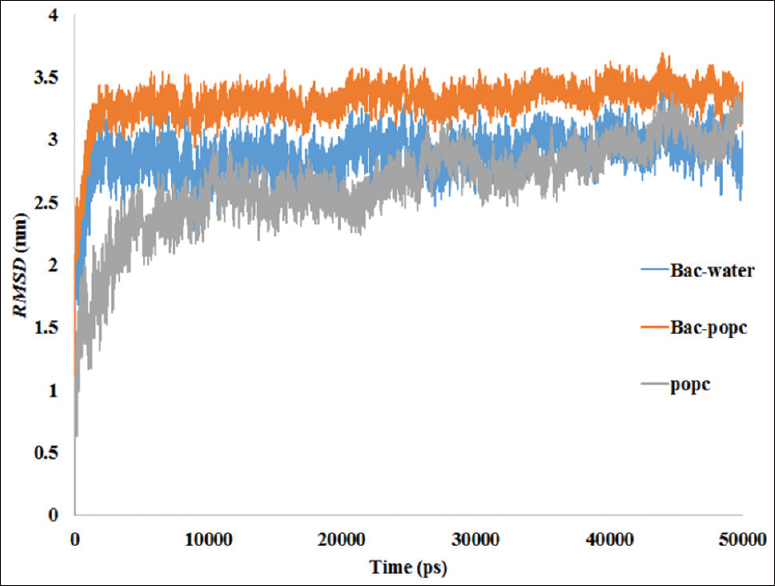 [Figure 4] shows that the H-bond between bactenecin and POPC has increased up to 20 during 50 ns simulation. These H-bonding interactions can cause consolidation of peptide within the membrane and may induce the persistent effect of peptide on bilayer. 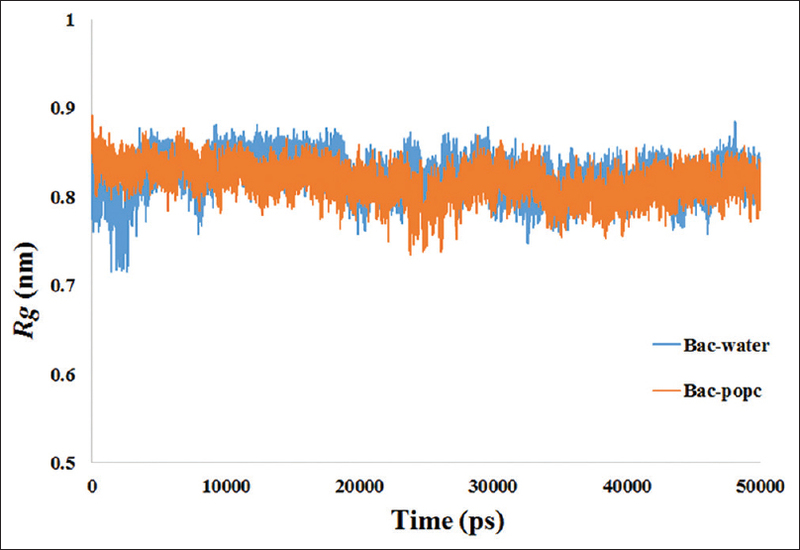 Deuterium order parameter is a phase transition factor during simulation. It also allows conclusions in fission distribution, even in very complicated conditions. The graph in [Figure 5] shows that the bactenecin peptide is placed in the membrane which makes the membrane to have more organization compared to the free POPC. This can lead to sol to gel switching and more rigidity of biomembrane. The density of the membrane was investigated in the bactenecin containing versus free POPC system and the results are depicted in the graphs in [Figure 6]a and [Figure 6]b, respectively. Based on considered co-ordinate, the results could be different, and so, the favored co-ordinate for this purpose is the z-axis. From these results, it can be concluded that the density of the different parts of system has no more changes when they are compared. On the other hand, there are some shifts in local density related to head groups in peptide-containing system that move to center of box. These changes can be because of compressing bilayer by peptide, leading to lowering of bilayer thickness. There are natural movements in the biobilayer membrane because of its liquidity, and anything that can destroy this membrane property can cause instability and loss of its natural function. The analysis of mean square displacement (MSD) can measure the lateral diffusion or flip-flop movants of biobilayer lipids and may be used to ensuring the membrane to save its natural mobility., [Figure 7] shows the decreasing of MSD in the bactenecin-POPC system than free POPC during the simulation. This result is an indication of lesser diffusion of lipids in the presence of peptide and abnormality in the POPC membrane caused by bactenecin. These results are in good agreements with those of deuterium order that suggests freezing effects of peptide on biomembrane. The area per lipid is an essential parameter for describing the state of molecular packing within a lipid bilayer. In this study, the average area per lipid molecule was estimated by multiplying the XY dimensions of the simulation box and divided by the number of lipid molecules present in one leaflet of the bilayer. Results show that at the end of simulation, the value is 65.8 A 2 for free POPC system and 62.3 A 2 for the membrane containing peptide. This finding shows some compactness in peptide-containing system during simulation time that can be because of bactenecin effects. 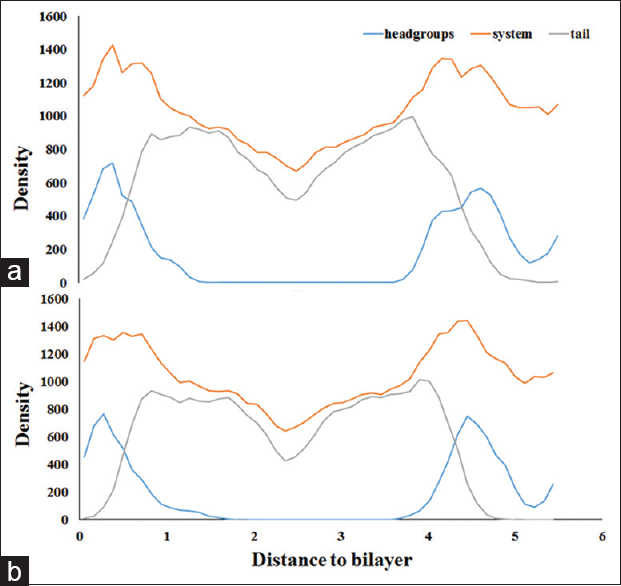 Bilayer thickness analysis checks the thickness of the biobilayer membrane during simulation. The thickness is high around the peptide before the simulation, and it decreases after it. [Figure 8] shows that in the last of simulation, the thickness of the peptide-embedded membrane is less than those of related to the beginning. The reason for this falling may be stretching the phospholipid head groups by bactenecin. 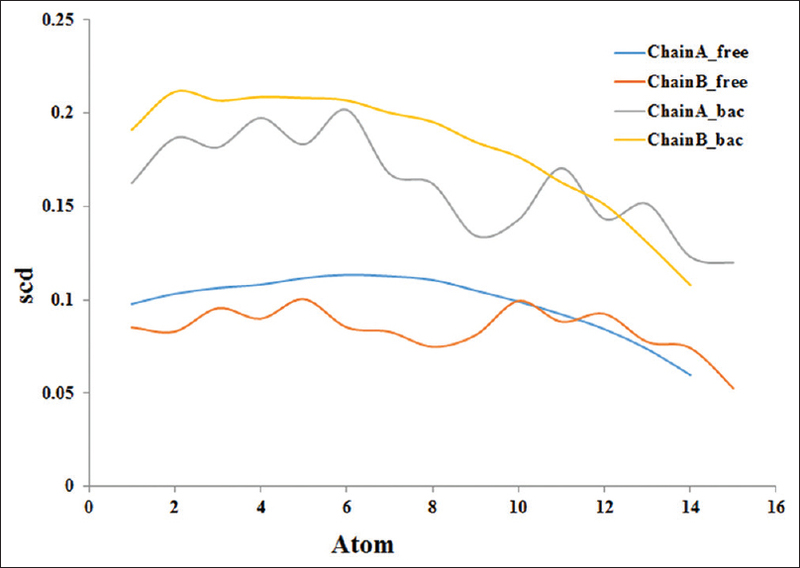 These results also are in good agreement with H-bonding and density analysis. As mentioned above, there were some H-bonding interaction of bilayer with peptide that can be because of stretching and decreasing in membrane thickness. In this study, important interactions and effects of AMPs of bactenecin on the POPC bilayer have been investigated using all-atom MDs simulation. The results show that RMSD value for peptide in POPC medium is more than those of in water and that can be because of more displacements of bactenecin in membrane. Peptide has made H-bonds with the heads of lipids and this makes the membrane more compact and the leaflets went close together after simulation. The presence of bactenecin in membrane causes instability of lipids and the liquidity index was decreased. Furthermore, insertion of peptide can cause more ordering in bilayer lipids and makes it more rigid. The bactenecin used in this study can be a part of more complex models in further studies. Overall, in this study, the harmful effects of bactenecin on the lipid bilayer membrane (POPC) are proved and it can be a confirmatory of its potential usage as antimicrobial agent. Zhang LJ, Gallo RL. Antimicrobial peptides. Curr Biol 2016;26:R14-9. Amani J, Barjini KA, Moghaddam MM, Asadi A.In vitro synergistic effect of the CM11 antimicrobial peptide in combination with common antibiotics against clinical isolates of six species of multidrug-resistant pathogenic bacteria. Protein Pept Lett 2015;22:940-51. Park CB, Kim HS, Kim SC. Mechanism of action of the antimicrobial peptide buforin II: Buforin II kills microorganisms by penetrating the cell membrane and inhibiting cellular functions. Biochem Biophys Res Commun 1998;244:253-7. Zasloff M. Magainins, a class of antimicrobial peptides from xenopus skin: Isolation, characterization of two active forms, and partial cDNA sequence of a precursor. Proc Natl Acad Sci U S A 1987;84:5449-53. Murzyn K, Pasenkiewicz-Gierula M. Construction of a toroidal model for the magainin pore. J Mol Model 2003;9:217-24. Boman HG. Antibacterial peptides: Basic facts and emerging concepts. J Intern Med 2003;254:197-215. Zasloff M. Antimicrobial peptides of multicellular organisms. Nature 2002;415:389-95. Tossi A, Sandri L, Giangaspero A. Amphipathic, alpha-helical antimicrobial peptides. Biopolymers 2000;55:4-30. Babakhani A, Gorfe AA, Gullingsrud J, Kim JE, Andrew McCammon J. Peptide insertion, positioning, and stabilization in a membrane: Insight from an all-atom molecular dynamics simulation. Biopolymers 2007;85:490-7. Anderl JN, Franklin MJ, Stewart PS. Role of antibiotic penetration limitation in Klebsiella pneumoniae biofilm resistance to ampicillin and ciprofloxacin. Antimicrob Agents Chemother 2000;44:1818-24. Emri T, Tóth V, Nagy CT, Nagy G, Pócsi I, Gyémánt G, et al. Towards high-siderophore-content foods: Optimisation of coprogen production in submerged cultures of Penicillium nalgiovense. J Sci Food Agric 2013;93:2221-8. Gennaro R, Zanetti M. Structural features and biological activities of the cathelicidin-derived antimicrobial peptides. Biopolymers 2000;55:31-49. Zanetti M. Cathelicidins, multifunctional peptides of the innate immunity. J Leukoc Biol 2004;75:39-48. Hill CP, Yee J, Selsted ME, Eisenberg D. Crystal structure of defensin HNP-3, an amphiphilic dimer: Mechanisms of membrane permeabilization. Science 1991;251:1481-5. Simmaco M, Mignogna G, Barra D, Bossa F. Antimicrobial peptides from skin secretions of Rana esculenta. Molecular cloning of cDNAs encoding esculentin and brevinins and isolation of new active peptides. J Biol Chem 1994;269:11956-61. Tieleman D, Sansom M. Molecular dynamics simulations of antimicrobial peptides: From membrane binding to trans-membrane channels. Int J Quantum Chem 2001;83:166-79. Moradi S, Taran M, Mohajeri P, Sadrjavadi K, Sarrami F, Karton A, et al. Study of dual encapsulation possibility of hydrophobic and hydrophilic drugs into a nanocarrier based on bio-polymer coated graphene oxide using density functional theory, molecular dynamics simulation and experimental methods. J Mol Liq 2018;262:204-17. Pourmousa M, Wong-ekkabut J, Patra M, Karttunen M. Molecular dynamic studies of transportan interacting with a DPPC lipid bilayer. J Phys Chem B 2013;117:230-41. Esmaili E, Shahlaei M. Analysis of the flexibility and stability of the structure of magainin in a bilayer, and in aqueous and nonaqueous solutions using molecular dynamics simulations. J Mol Model 2015;21:73. Leontiadou H, Mark AE, Marrink SJ. Antimicrobial peptides in action. J Am Chem Soc 2006;128:12156-61. Sengupta D, Leontiadou H, Mark AE, Marrink SJ. Toroidal pores formed by antimicrobial peptides show significant disorder. Biochim Biophys Acta 2008;1778:2308-17. Daura X, Mark AE, Van Gunsteren WF. Parametrization of aliphatic CHn united atoms of GROMOS96 force field. J Comput Chem 1998;19:535-47. Darden T, York D, Pedersen L. Particle mesh Ewald: An N ⋅ log (N) method for Ewald sums in large systems. J Chem Phys 1993;98:10089-92. Berendsen HJ, Postma JV, van Gunsteren WF, DiNola A, Haak J. Molecular dynamics with coupling to an external bath. J Chem Phys 1984;81:3684-90. Parrinello M, Rahman A. Polymorphic transitions in single crystals: A new molecular dynamics method. J Appl Phys 1981;52:7182-90. Humphrey W, Dalke A, Schulten K. VMD: Visual molecular dynamics. J Mol Graph 1996;14:33-8, 27-8. Klepeis JL, Lindorff-Larsen K, Dror RO, Shaw DE. Long-timescale molecular dynamics simulations of protein structure and function. Curr Opin Struct Biol 2009;19:120-7. Kong Y, Manke C, Madden W, Schlijper A. Simulation of a confined polymer in solution using the dissipative particle dynamics method. Int J Thermophys 1994;15:1093-101. Luzar A, Chandler D. Structure and hydrogen bond dynamics of water-dimethyl sulfoxide mixtures by computer simulations. J Chem Phys 1993;98:8160-73. Jeffrey GA, Jeffrey GA. An Introduction to Hydrogen Bonding. New York: Oxford University Press; 1997. Tarek M, Tobias DJ. Role of protein-water hydrogen bond dynamics in the protein dynamical transition. Phys Rev Lett 2002;88:138101. Scott HL. Monte carlo calculations of order parameter profiles in models of lipid-protein interactions in bilayers. Biochemistry 1986;25:6122-6. Lindblom G, Orädd G, Filippov A. Lipid lateral diffusion in bilayers with phosphatidylcholine, sphingomyelin and cholesterol. An NMR study of dynamics and lateral phase separation. Chem Phys Lipids 2006;141:179-84. Kandasamy SK, Larson RG. Binding and insertion of alpha-helical anti-microbial peptides in POPC bilayers studied by molecular dynamics simulations. Chem Phys Lipids 2004;132:113-32.